When I finally decided to start blogging I struggled with the question: should I make product recommendations in general, and post my puppy supplies list specifically, or not? I made the final decision to do it because of something that happened recently …. * a COVER is available which is a great safety feature if your puppy is a climber. A cover is also helpful if you have a cat in your home that may jump into the pen. Depending on the type of flooring you have, you may want to protect it. An OFFICE CHAIR MAT placed under the pen works great for this! PEE PADS – The two options are disposable and washable and the choice will depend on your situation and your puppy. Families who do not have a washer and dryer in the home will find it easier to use disposable and those who do may prefer washable. I use washable because puppies sometimes shred the pads when they are very young and because of their size, they can easily get an intestinal obstruction if they eat the pieces. By the time pups are big enough to go home the risk of that happening is less so either one is fine but if your puppy is a “shredder” you will want to go with washable. A TRAY to hold the pad in place is helpful if you are using disposable pads. ENZYME CLEANER like Nature’s Miracle or a 50/50 mixture of white vinegar and water to clean potty accidents. If you choose to use vinegar but don’t want your house smelling like salad you can add a drop or two of KOE or Angry Orange to a spray bottle full of the mixture and the problem is solved. BED – I recommend using a flat crate mat type of bed in the pen. They’re inexpensive so you can get 2, that way if your puppy has an accident you have a clean one available. Bigger (and when I say bigger what I really mean is taller bolster or donut style) beds can become ladders your puppy will use to escape from their pen so use those outside of it. ROYAL CANIN YORKSHIRE TERRIER PUPPY FOOD – I am well aware that some of the dog food review websites do not rate this food well and while those reviews have validity and on paper there may be better foods, I have one very important reason for feeding it …. my pups eat it!!! It doesn’t matter if a food has a 5 start rating if your pup turns their nose up at it and this food is the one that my pups eat the most consistently and do the best on so please do not change your puppy’s food unless instructed to do so by your vet. 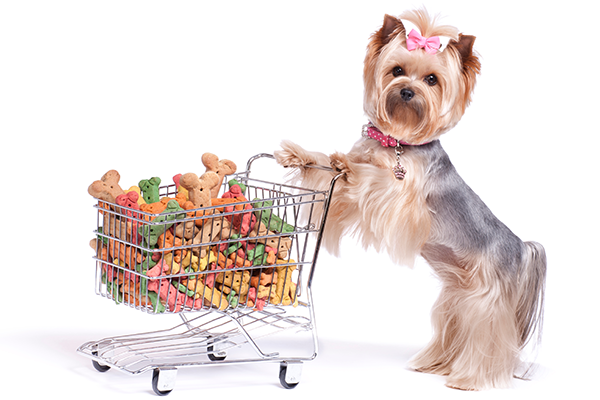 NUTRICAL – This is NOT something that should be given to your puppy on a regular basis. It will only be used to stimulate your pups appetite if he/she is not eating OR if your puppy is displaying symptoms of hypoglycemia. HARNESS and LEASH – I know there are some really cute harnesses available but your puppy will outgrow that expensive harness fast so I recommend not spending a ton of money on these until your puppy is full grown. A reasonably priced adjustable harness that can grow with your pup is fine for young pups. My favorite for training is by Puppia (most Let’s Talk Yorkie pups will be an XS) with the matching leash of course. TREATS: Bil-Jac Treats – any flavor EXCEPT Original (this flavor is too high in protein for small breed dogs). The reason I like these are that they are soft (think Tootsie Rolls) so, because they are much too big for your puppy, it is easy to cut them into tiny pieces and use as reward in training. CARRIER to take your puppy home in and for trips to the vet. There are two basic types, hard plastic and fabric and either one is fine. STAIRS – To avoid future knee problems, I highly recommend teaching Yorkies (and other small breed pups) to use stairs to get on and off furniture as soon as they are big enough to use them. I’d love to know how my suggestions worked out for you and for you to tell me about your favorite puppy products in the comments. Your list was so helpful. I was able to get everything my Bella will need. I plan on potty training my Bella outside. I was going to also use puppy pads inside her Iris pen? Will that confuse the puppy? My plan is to be very diligent on outdoor potty training. Also, do you send the new parents home with a daily planner that you typically followed in “your” home before the puppies parents pick them up. Your list is awesome. Everything for the new baby to come home. If you recommend a specific area I should place my future puppy bed and pen? and one for her to play in and get adapted to her new home.